NASHVILLE, Tenn. (August 19, 2015) – It's traditional country music at its finest paired with family-friendly comedy from two of the genre’s most dynamic personalities. 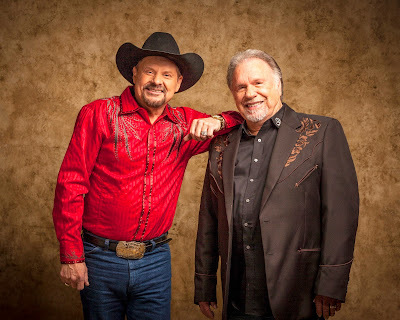 Country music legends Gene Watson and Moe Bandy are set to perform hit after hit and teach one another a thing or two, in a one-hour primetime TV special on RFD-TV September 18. The Gene & Moe Show, in which Watson and Bandy battle it out for the show’s naming rights prior to each episode, periodically switches its name to The Moe & Gene Show illustrating an ‘all-in-good-fun’ facetious on-screen competition between the two long-time friends, Produced by Gabriel Communications (known for top-rated variety shows Larry’s Country Diner, and Country’s Family Reunion) the new series was previously recorded at Joey+Rory's Farmhouse Concert Hall in Columbia, Tennessee. Featuring performances of their fan-favorite classic country songs in front of a live studio audience, Watson and Bandy also interview various celebrities like drag racing driver “Big Daddy” Don Garlits and rodeo champion Larry Mayhan. Along the way, they humorously teach one another tricks of the trade when it comes to their non-musical hobbies; for Watson, that’s cars and trucks, and for Bandy -- cows and bulls. Viewers will get a kick out of watching Bandy pick on Watson as he learns how to feed a calf, and vice versa, as Bandy tries to do some maintenance work on one of Watson’s prized classic cars. Watson and Bandy have been friends since back in the 70’s. Bandy was coming onto the scene with “I Just Started Hatin’ Cheatin’ Songs” and Watson was singing about “Love in the Hot Afternoon.” These two classics marked the beginning of more than two decades of chart topping country radio hits respectively. Tune in for additional airings of The Gene & Moe Show on RFD-TV, listed here: http://www.rfdtv.com/category/267411/schedule.